Lucia, which is celebrated on December 13th, is a Swedish tradition dating back to the Middle Ages. Though there are many versions of the story, as with a lot of folklore, the constant is that Saint Lucia was an Italian Christian in Roman Times. There was allegedly also a Swedish festival prior to the arrival of Lucia called Lusse (devil). The earlier festival was based around the winter solstice and marked the beginning of longer daylight. Eventually the Lutheran church stepped in and things got switched around a bit, as you might imagine. Today it is a very popular holiday especially for children. They eat cakes (saffron bread with raisins), drink milk and eat gingerbread cookies. Rumor has it that the devil festival was a little more spirited (pun intended). 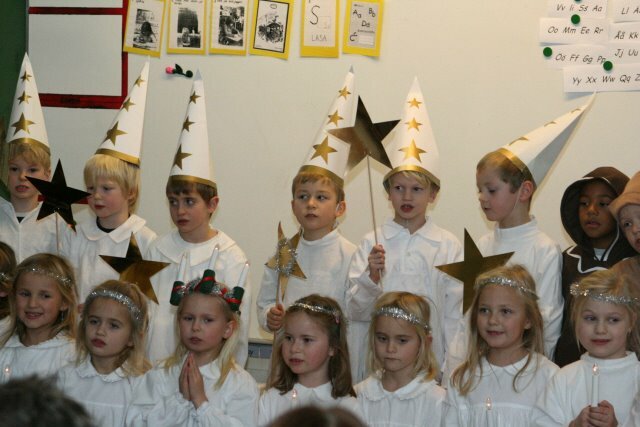 This is our kids first Swedish Lucia (above with their first grade class), and they adapted both to singing and dressing up in traditional costumes as well consuming large quantities of cookiea and cakes.